Bosch – FHP specializes in highly efficient heating and cooling solutions for commercial retrofit and new construction applications. In 2007, Bosch acquired Florida-based FHP Manufacturing Co., a manufacturer of electric geothermal heat pumps and entered the commercial HVAC market with a complete line of heat pump systems to meet your needs. Bosch focuses her mix in two categories of product: commercial water heat pumps and air handlers. The uncompromising quality of all FHP products makes them the ideal choice for the commercial new construction market and the ease of designing into tight retrofit spaces of buildings. Water-to-Air Heat Pumps: this solution is available in configurations that vary from ½ to 6 tons. Rooftop Packages: High-quality solutions for 100% outside air applications. 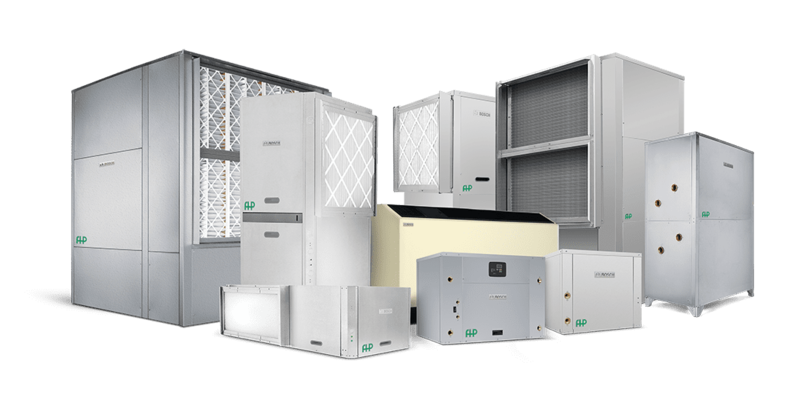 The RT Model Rooftop incorporates an integral heat pump and energy recovery wheel to provide you with a high quality, engineered economical alternative for 100% outdoor air applications traditionally requiring expensive, custom-built equipment. Bosch offers durable and reliable horizontal and vertical commercial air handlers for both indoor and outdoor installations. To download the company’s commercial products catalog, click here. Or visit their website here for more information.